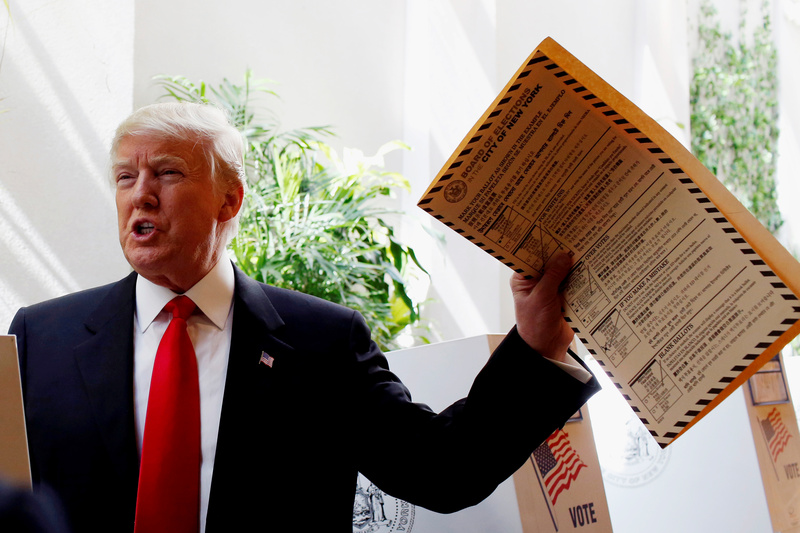 Donald Trump was for the first time able to vote for himself for the presidency, which he did late Tuesday morning at the Central Synagogue Pavilion in Manhattan. Minutes after he voted in the New York primaries, Trump called it a great honor to be able to vote for himself, and CBS News' Major Garrett asked him what a New York win would mean to him. "It would mean a lot," Trump responded. He was also asked about whether opponent Ted Cruz should drop his bid for the White House. Trump said he thought so but said it was Cruz's decision. When he returned to Trump Tower, the billionaire candidate talked a little more about what it meant to him to vote in New York Tuesday morning. "It's a proud moment, it's a great moment. And who would have thought? And it's just an honor. And my whole reason for doing this is to make America great again. We're a country with tremendous problems and we are going to make America great again." Expectations are high for Trump, who's running away with the race in his home state of New York. The only real question is the size of his win. There are 95 delegates at stake in the New York GOP primaries, and opponents Ted Cruz and John Kasich are attempting to deny him a few of those delegates, though at the end of the day, it is likely they'll only be able to pick off a few. Cruz and Kasich focused on New York congressional districts, each of which has three delegates to award. Where Trump wins over 50 percent of the vote, he'll be awarded all three delegates. If he wins with a plurality, then he would get two of the delegates and the next candidate would get one. With this in mind, Cruz and Kasich targeted districts 7 (parts of Brooklyn, Queens, Manhattan), 12 (East side of Manhattan, part of Queens), 13 (upper Manhattan, part of the Bronx), 14 (parts of the Bronx and Queens) and 15 (the Bronx, scored as the most Democratic district in the nation by the Cook Partisan Voting Index) -- populous districts with very few Republicans -- with just about 13,000 - 18,000 GOP voters in each of those districts. Trump delegate strategists are predicting he'll pick up a minimum of 88 delegates, and as many as 92, chief White House correspondent Major Garrett reports. So, while he may not run the table, there is little doubt he'll win the lion's share of delegates available.